Monolithic Silica | SnG Inc.
Monolithic silica is an integral porous body with a characteristic structure connected with a mesh-like skeleton of micrometer order. It looks like a chalk, but when you observe it with an electronic microscope, it has a structure with a skeleton like a jungle gym. Numerous holes (pores) called micron-scale through pores are opened around the gap of the skeleton, and holes called nanoscale small pore are opened inside the skeleton. The through pore and the small pore are connected, and have a high porosity that is about 85% of the total volume becomes a hole. Furthermore, it has a high specific surface area because there are numerous nanoscale small pores. The large monolithic silica manufactured at our company is made of silica, its purity is over 99.9%. 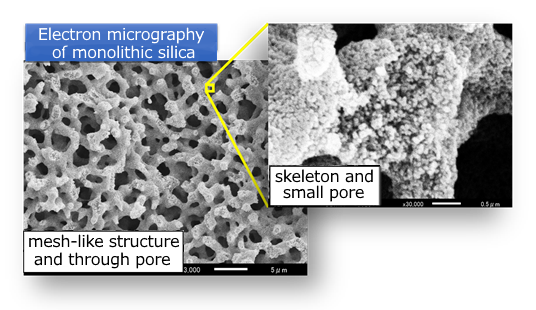 The monolithic silica, which is a bicontinuous porous body composed of through pore and small pore, is capable of independently controlling the size of these bimodal pores when the material is silica(through pore: 0.1-50 µm, small pore: 0-100 nm), it has the characteristic that each pore size can be optimized according to the intended purpose. 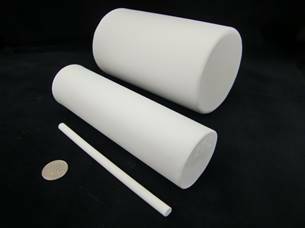 Since monolithic silica has high porosity and specific surface area, it is used as low pressure and high performance filter and adsorption column. It can be optimized according to the intended purpose. For example, by adjusting the pore diameter according to the size of the target molecule, it becomes a high performance column with size discrimination ability to remove only the molecular size intended to be removed. Since it can contain many liquids, it can be used as a material that slowly releases medicinal ingredients from monolith impregnated or adsorbed medicinal ingredients. 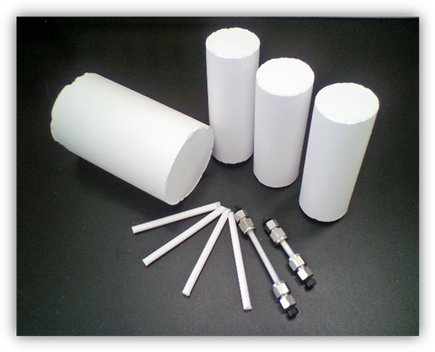 As a main practical example of monolithic silica, a column for high performance liquid chromatography (column for HPLC) with very low backpressure has already been commercially available. However, the conventional monolith synthesis technology has high difficulty and the yield is not stable, it is limited to synthesis on a few milliliter scale, and the expansion of application of large monoliths was limited. We have established manufacturing technology by reviewing the manufacturing method of monolithic silica drastically to make it larger and large mass production beyond 1 liter scale. In addition, our unique technology minimizes partial disorder of the microstructure due to its large size, realizing a homogeneous monolith showing constant performance regardless of where it is cut out. In order to use the monolithic silica effectively, it is necessary to prepare a column by coating a block monolithic silica with a jacket. But due to the high difficulty of this column manufacturing technology, the expansion of application to other practical use was remarkably limited. We reviewed the machining technology of the monolithic silica, succeeded in precision machining of the monolithic silica on the order of micrometer, established a proprietary high pressure resistance column technology with stainless jacket. These proprietary technologies have realized large size monoliths and high pressure resistance columns, enabling broad application of monolith technology. 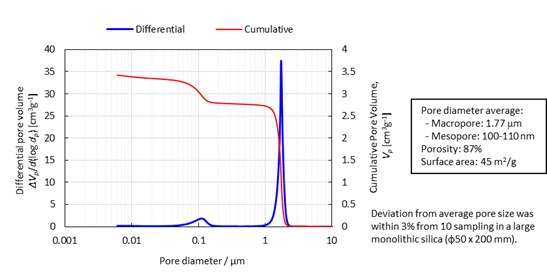 Both the through pore diameter and the small pore diameter of the monolithic silica are controllable independently, and the monolithic silica column demonstrates excellent separation performance from small molecules to separation of macromolecules such as peptides or proteins. The mesh-like skeleton of the monolithic silica is formed by aggregation of spherical particles of several nanometers. The small pores are the gaps between agglomerated spherical particles. In the past development examples, we developed a column for therapeutic aphresis, a specially controlled medical devices, and acquired CE mark and ISO 13485 corresponding to medical version ISO 9001. We have established a manufacturing method compliant to ISO and can manufacture monolithic silica with quality assured. Based on the circumstances of development of monolithic silica as an invasive medical device, it has received an assessment in conformity with ISO 10993 which is the international standard of biological evaluation, and it has been confirmed that it is safe from the viewpoint of cytotoxicity, blood compatibility and chemical toxicity. Also, since the monolithic silica uses 99.9% water glass as the raw material, the purity of the monolithic silica gel obtained is appropriate and it does not contain heavy metals at all. Monolithic silica has excellent thermal stability, mechanical strength and chemical stability because of its unique mesh-like skeleton. Monolithic silica is pure silica gel and withstands high temperatures exceeding 800 ℃. Also, it will not break down even under pressure of several hundred kilograms as used in HPLC as material strength. It also has the property to withstand organic solvents and acids. Monolithic silica is a technology invented by Professor Naohiro Soga and Professor Kazuki Nakanishi of the National University Corporation Kyoto University Faculty of Science.